To complete each level you must rescue all of the men in the water. 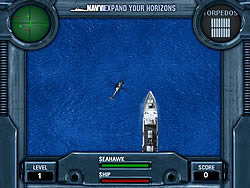 Destroy the submarines attacking your ship with your torpedoes to keep your frigate afloat. Patrol boats will attack your helicopter. Destroy them with your torpedoes. Attack helicopters will attack your Seahawk, only your frigate's missiles can protect you from them.